Many, many books exist on writing memoirs. One of my favorites is On Writing Well by William Zinser. His suggestion is to write one story per day based on whatever comes to mind at the time you sit down to write. After 2-3 months of writing, you can review your stories and see how your writing "voice" has developed. Sometimes, a challenge can be to think of an event to write about. Author Richard Stone has written two books which focus on how stories can have a healing influence. In both The Healing Art of Storytelling and Stories: The Family Legacy he suggests that you draw maps of places you have visited or lived. You can also draw blueprints of houses where you lived, schools you attended, or places you worked. Because our lives of filled with experiences, often thinking of these places is enough generate many stories. Family trees are also great for generating story ideas and remembering events with favorite (and not so favorite) aunts, uncles, cousins, and grandparents. From 3 to 12 I lived outside of Chattanooga in the small community of Collegedale. With the ability to visit any part of the planet vicariously via Google Maps, I revisited my old neighborhood and saved the satellite image. Using an illustration application, I drew some notes onto the map. As I made these notes, I was reminded of many stories that occurred in my neighborhood. In the 1970s, a tornado destroyed a house under construction in our neighborhood. The spiked nailed panels that held the roof trusses together were scattered and could be bent around your arm to make Roman-styled arm bands. There were several trails in the vacant lot owned by my parents next to our house. The back property line was shared with an adjacent cow field, where many games were played with friends. My friend Jeremy lived in a duplex at the bottom of the hill. Later on, his family moved to a house on the same street. My first piano teacher lived a couple of houses away from us. Despite her best efforts, I was more interested in watching Batman on TV and was more concerned about being back at home by 5:30 to watch Batman than complete a full 30-minute lesson. As you can see, this mapping technique is a great way to develop stories and remember events. There are many more stories I could tell just from viewing the map. I'm sure that if my brother or sister viewed the same map, they could generate many of their own stories based on their experiences. I could have easily zoomed out to display the entire city of Collegedale. Had I done so, I could have shared stories about walking to school, my school playground, and many other events. I encourage you to think about all of the places you have visited or lived. 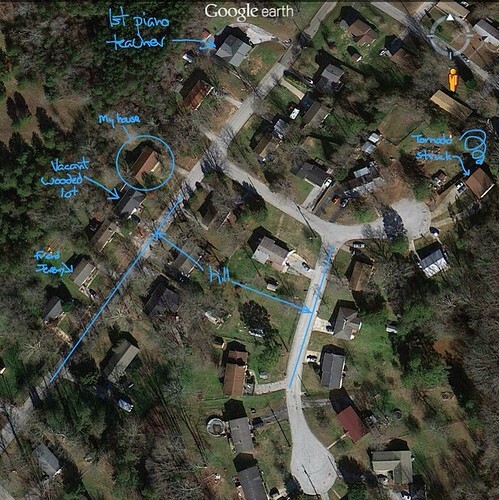 Draw a map or create one using Google Earth (or another mapping application). You'll be amazed at how many events you can remember. I used three iPad apps to create the map for this post. Thanks for writing a very nice post.